Fighters from the Movement for the Salvation of Azawad (MSA) in the Menaka area of the Gao region, northern Mali. 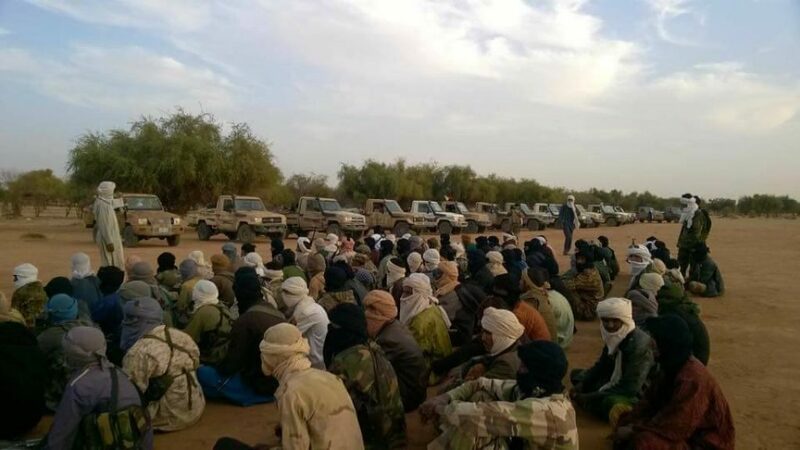 Two Tuareg militias in northern Mali, the Imghad and Allies Self Defense Movement (GATIA) and the Movement for the Salvation of Azawad (MSA), have battled militants loyal to the Islamic State over the past few days. The jihadists are under the leadership of Abu Walid al Sahrawi, the leader of the so-called Islamic State in the Greater Sahara (ISGS). GATIA, which is a largely pro-Mali militia, released a statement on Feb. 23 reporting that its forces, alongside the forces of MSA, conducted a joint operation in the In-Delimane area of the Gao region against militants under the leadership of Abu Walid al Sahrawi. According to the Tuareg militia, six jihadists were killed or captured while one vehicle originally belonging to the Nigerien military was recovered. The MSA, which is largely pro-Tuareg autonomy but allied to GATIA, released the same statement, promising more joint operations against the jihadists will occur. Clashes between the GATIA-MSA alliance and the jihadists also reportedly happened today. Strikes and operations against the jihadist group will likely continue to occur as long as Sahrawi’s militants operate in the region. Many unconfirmed ISGS attacks on Tuareg militias in the Gao region have been reported for months. While not mentioned in the statements, French special forces have been taking part in the operations alongside the Tuareg groups. RFI reports that the operations, which began on Feb. 22, were aimed at killing or captured Sahrawi, but he reportedly fled the area. The In-Delimane region of Gao, the site of the clashes between the Tuaregs and jihadists, was also the location of a deadly improvised explosive device (IED) ambush on French troops last week. Two French soldiers were killed and a third was wounded by an IED while on a patrol near the locale. While the ISGS is known to operate there, al Qaeda’s Group for Support of Islam and Muslims (JNIM) claimed the attack. The Islamic State-loyal forces led by Abu Walid al Sahrawi, referred to as “Islamic State in the Greater Sahara” (ISGS), has been linked to several attacks in the Tillabery region of Niger, the Sahel region of Burkina Faso, and in the Gao region of Mali. This includes last October’s ambush in Niger which killed four US Special Forces soldiers and a suicide bombing on French troops in the Gao region earlier this year. ISGS gained little publicity from Islamic State central, with its pledge of allegiance only being acknowledged in an Amaq video a year later. Nevertheless, the group continues to operate in the Sahel with loyalty to the Islamic State. Defections from al Qaeda’s JNIM, as well as from the jihadist faction Katibat Salahadin led by Sultan Ould Bady, to ISGS have been reported.